Christmas is undoubtedly one of the most beautiful times of the year. We are used to spending this time with the family and if you imagine the holidays you will see in your head a cold place and a sweater with a reindeer, but what if this year we celebrate Christmas on a sunny beach? That time of year has already arrived when we resist going out into the street without a good coat, we have given up putting on a dress or short trousers and we have exchanged cocktails for hot chocolate. However, you still have time to give yourself a holiday and come looking for a little sun. The Canary Islands are known for their pleasant and constant temperatures that remain stable throughout the year, between 18 º and 24 º, thanks to our geographical position. Without a doubt, Tenerife is a tropical destination where you can travel during the winter and enjoy the eternal summer. It’s a privilege compared to most cities in Europe! What to see during my winter holidays in Tenerife? Tenerife is an island that has a million different plans that you can make during your holidays. For those who travel with children you can enjoy a quiet day at the beach, an entertaining trip to Siam Park or even golf lessons for young and old. If your idea of a perfect holiday, on the other hand, is not to leave the hotel, to have all the services at your disposal, fun for the children, a pleasant place to rest and a swimming pool to refresh yourself in, Tenerife is also your place! But the best advice we can give you is to choose well where you are going to stay because, a wrong decision, can crush your family vacation. Where can I stay during my winter holidays in Tenerife? We invite you to visit our luxurious and modern apartments. 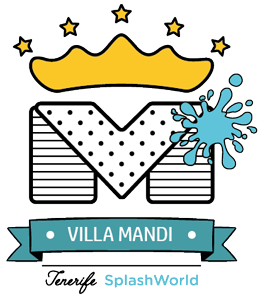 Staying at Villa Mandi Golf Resort is the best decision to enjoy a family holiday. Our apartments are fully equipped to cover all your needs, our extensive catering service so that you can always find something of your own to eat, our fabulous animation team to entertain the little ones while you rest… The best way to enjoy a family holiday! Living a different Christmas is a closer option than you think. The sunny island of Tenerife is just a short trip from Europe’s major cities and has thousands of air connections to get here. It’s time to say ‘yes’ to your sunny winter holidays!